Tried to draw Michael using colored pencils here. I really enjoyed drawing this one, and even if colored pencils are really tricky, it was still a joy to do this! Michael is performing Thriller here during the Bad era, but I decided to name it “Make Me wanna Scream” for Michael seemed to shout here. That’s my daughter Naomi commenting on her own drawing at artwanted.com. Michael Jackson appears so slim in the drawing. I wonder if he ever took Lipofuze to maintain his built when he was alive. 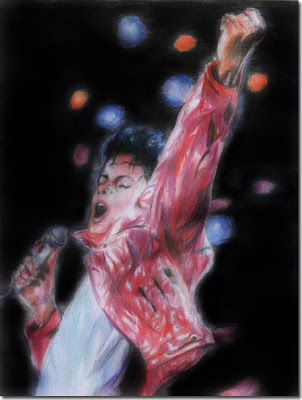 This entry was posted in Uncategorized and tagged Bad, Michael Jackson, sketch of Michael Jackson, Thriller on October 23, 2010 by Yami. Very talented talaga dalaga mo sis.